A composite image of the SN 1006 supernova remnant, which is located about 7,100 light-years from Earth. Image released on Sept. 26, 2012. The brightest exploding star ever seen with the naked eye in recorded history apparently experienced a quick and lonely death, a new study reveals. The discovery, which centered on a star explosion witnessed in the year 1006, suggests that many similar outbursts leave no companion star to accompany their demise. The most powerful exploding stars in the universeare supernovas, which are bright enough to momentarily outshine their entire galaxies. One type of star explosion, known as a Type 1a supernova, occurs when one star pours enough fuel onto a dying companion star known as a white dwarf to trigger an extraordinary nuclear explosion. Our sun and more than 90 percent of all stars in our galaxy will one day end up as white dwarfs, which are made up of their dim, fading cores. There are two ways Type 1a supernovas are born — the slow way, which involves a living star dumping gas onto a white dwarf, and the fast way, where two white dwarves merge catastrophically. The slow route would leave the white dwarf's companion behind, while the fast one would effectively blast away discernible traces of either white dwarf. Whether slow origins of Type 1a supernovas were more commonplace than fast ones or vice versa remained a puzzle. Knowing more about the causes behind these explosions is essential because Type 1a supernovas are key to gauging the rate at which the universe is expanding, which in turn could shed light on why this expansion is apparently accelerating due to a mysterious force called dark energy. Scientists have tried looking for companion stars of Type 1a supernovas before. 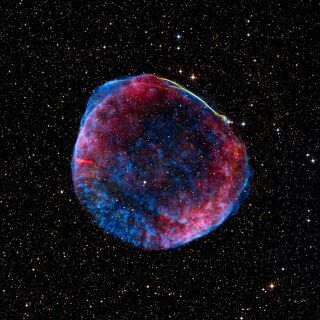 One possible instance was Tycho's supernova, SN 1572, one of the few supernovas visible to the naked eye in historical records, although that case remains questioned. Now a fruitless search for a companion star to the brightest supernova ever seen with the naked eye on Earth suggests this explosion took the fast route. Using data from the Paranal Observatory in Chile, the researchers combed through the space 16.5 light-years in diameter around SN 1006 and "do not find any star in the surroundings of the supernova remnant to be the possible companion of the progenitor of SN 1006," lead study author Jonay González Hernández, an astrophysicist at the Institute of Astrophysics of the Canary Islands in Spain, told SPACE.com. When combined with previous results, these findings suggest less than 20 percent of Type 1a supernovas apparently occur via the slow route. The scientists detailed their findings in the Sept. 27 issue of the journal Nature.